The Egyptian film industry is one of the oldest in the region, with a few silent films being produced as early as 1896. In the early 20th century, the introduction of sound to cinema helped Egypt secure its place as a cinematic powerhouse in the region. Indeed, Egypt quickly became home to some of the region’s most creative souls in all the fields that surround cinema production. It is not surprising, therefore, that Egypt was also home to some of the region’s – and the world’s – most innovative directors. Today, we are talking about an event that has been created with the intention of honouring one such filmmaker: Youssef Chahine. Indeed, Chahine was at the helm of many cinematic artworks. Chahine’s films discussed a wide array of issues and themes, including love, war, politics, loss, racism, identity, and even sexuality, making his films a full course meal. Perhaps, a testament of Chahine’s genius came in the form of the 1997 Life Achievement Award that he was awarded at the prestigious Cannes Film Festival. In honour of this master of form and content Zawya Cinema, Cairo’s underground cinema hub, will be hosting a special screening of 20 of Chahine’s works. 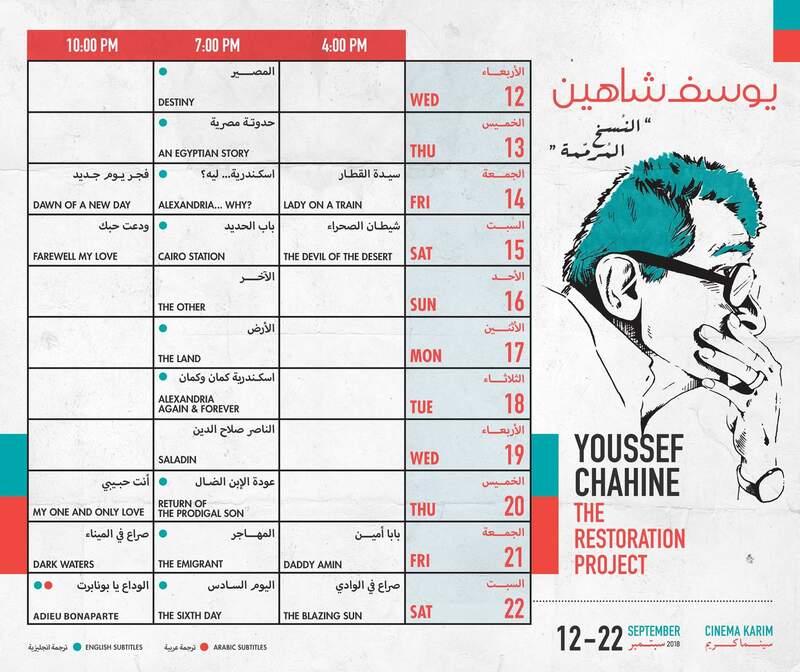 The screenings, collectively titled Youssef Chahine: The Restoration Project, will begin on the 12th of September and will end on the 22nd of September. The screenings will take place at Downtown Cairo’s Karim Cinema, and they will be accompanied by several workshops, lectures, and discussion panels. Zawya hasn’t yet announced the subject of the lectures and/or the workshops, but you can follow Cairo 360’s event calendar for updates. You can also head to Zawya’s Facebook page.